If you’re giving tech gifts this holiday season, be prepared to spend up to half a day helping your loved ones set them up. 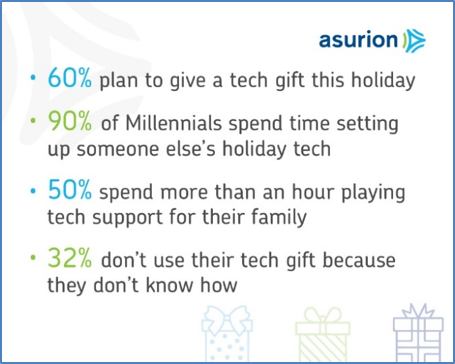 Unless people get help setting up and learning how to use their tech gifts, they may not use them at all, according to a recent survey sponsored by global tech services leader Asurion1. Mobile phones, laptops and tablets were items that have needed the most set-up help. However, smart home products like Google Home, smart light bulbs and internet-connected security cameras are becoming increasingly popular gifts, requiring more extensive setup and connection to other devices. Given that a third of respondents have family who don’t use their tech because they don’t know how, having access to expert tech help is more important than ever. Smart tech help from Asurion provides unlimited access to tech experts via phone or live chat to help solve any tech issue you could ever have with any device you’ll ever own, from setting up streaming services on a new smart TV to syncing a smart phone to a vehicle. Unlike traditional tech support, there are virtually no transfers or waiting on hold, and there’s no tech question too big or small regardless of the tech brand or operating system. Holiday shoppers have access to Asurion’s smart tech help through select mobile phone protection plans sold through major wireless carriers, or a Walmart Product Care Plan powered by Asurion. As part of the Walmart Product Care Plan, customers will receive 30 days of Soluto® premium tech help at no additional charge.